Facebook/Union FareFunfetti sprinkles and marscapone cream fill this birthday cake croissant. The cronut craze and rainbow bagel obsession are now things of the past. 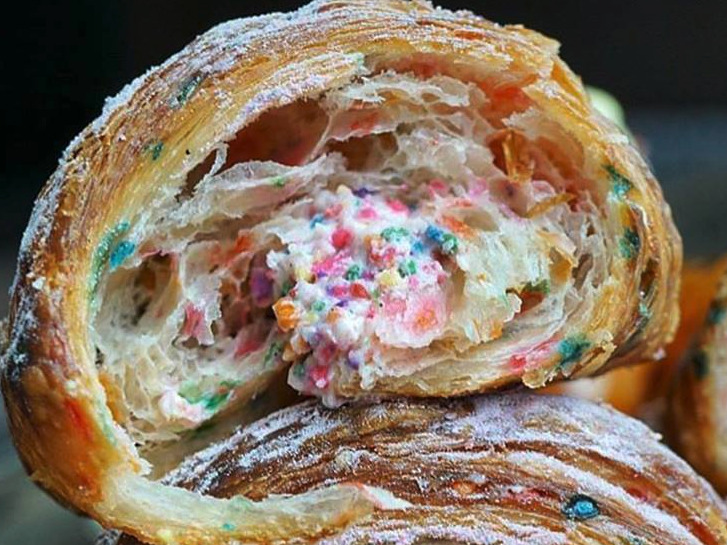 Meet New York City’s newest dessert sensation: the birthday cake croissant. Just five weeks ago, executive pastry chef Thiago Silva introduced this drool-worthy hybrid at Union Fare, a new gastrohall and bakery. Since its debut, people have been lining up to get their hands on the Funfetti-style pastry. Rainbow sprinkles give the flaky croissant layers a burst of colour, and the marscapone filling just makes everything a bit more tantalising. Just take a look at this beauty. While the birthday cake croissant is going viral, people are also losing their minds over Union Fare’s other crazy croissant variations. Red velvet, crème brûlée, matcha are just some of Chef Thiago’s playful inventions. Union Fare is still trying out new flavours. Cookies and cream croissants hit the bakery’s racks just three days ago.